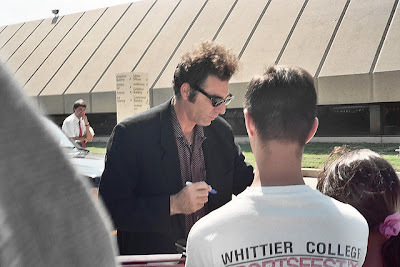 September 12, 2010 /PN/ Seinfeld star Michael Richards has been targeted in a new lawsuit over allegations he randomly attacked a photographer in a street. In the lawsuit, photographer Brendon O'Neal alleges that Richards approached him on the street in a "menacing manner ... with closed fists" on August 25, then punched him in the face, knocked him to the ground and "proceeded to kick (O'Neal) numerous times, directing the blows to (O'Neal's) arms, hands, and camera." The photographer is seeking unspecified damages for "great mental, physical, and nervous pain and suffering" and medical expenses, according to TMZ.com. Richards was previously involved in a 2006 incident in which he unleashed a torrent of racial slurs on a heckler at a West Hollywood comedy club. Hmmmm.... Could this man have a chip on his shoulder? Too much of this kind of thing happening now. I think every photographer who is treated like this or in any way hampered or threatened needs to take a stand. Freedom of speech is of such great importance, and as photographers we speak through our work. We must take a stand against all threats to that freedom if we want to keep it. He's lucky he didn't try that on me, I would have shot the mother fucker dead.